On Saturday we were hauling hay to the horses and cattle. On the very last big round bale, the Oliver ran out of fuel ten feet short of the gate into the training ring. Luckily, the cattle did have some hay left, they were just getting more. We had to wait until we went to town to get diesel fuel. After getting fuel, Will filled up the tractor and primed the injectors. Then he gave it a shot of starting fluid and cranked it over. But because it was still below zero, no dice. He waited instead of grinding the battery down since it was supposed to warm up. 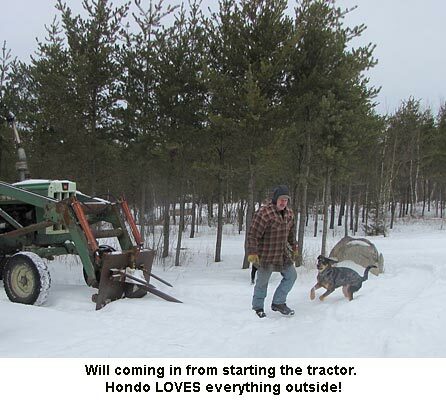 Once it warmed up a little he put the propane heater under the tractor for an hour or so, then repeated the sequence. It fired up and before I could get down the hill, Will had delivered the bale of hay and parked the tractor in its spot by the storage barn. 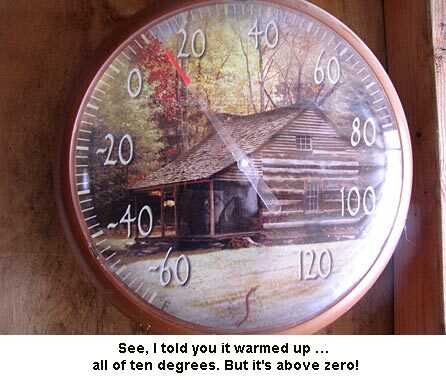 Now when I say “warmed up,” that means that it was above zero today — ten degrees to be exact. But with a 30 mph wind, it was still COLD. Only the dogs like the weather. We’ve got another weasel hanging around. Yesterday I saw his tracks coming from the orchard to the side of the chicken coop, around to the door where he stood with his feet up on the door sill. We’re hoping he’s thinking about MICE, as there is no better mouser in the world, not even Mittens. But after having my purebred rabbits and pheasants wiped out entirely by a weasel in one night years ago, it gives me the shivers. I’m glad we shut the birds in every night! I’m waiting for my petunia seeds to come in the mail so I can get them started. They stay small so long and this year I want to get my hanging baskets planted with petunias early enough that when I set them out they’re flowering nicely. Jackie I am confused, what do you mean by peppers go in tomorrow? Isn’t it too early to start them inside? I am glad Will was able to get the tractor started and back to the right parking place. Cold weather is tough on all of us. I’m glad you haven’t had frozen water lines to deal with.